Having endured one of his leanest patches in Test cricket Rahul Dravid feels his form is "slowly coming together". He ground his way to an agonisingly scratchy half-century in the first innings in Sydney but Dravid thought his last two innings were moves in the right direction. "I feel like I've been batting quite a bit of time in the middle," Dravid said after his 62 in the first innings of the warm-up match against ACT Invitational XI in Canberra. "I just feel the timing has not been as good as I've liked it to be. It's slowly coming together. It's a question of keeping on fighting. I've been good in the second innings in Sydney and here as well." During India's previous away tours, Dravid went through three Tests in South Africa in 2006-07 without a half-century and didn't make much of an impact in England in 2007. The rough patch continued through the home series against Pakistan as well. Take out Bangladesh and Dravid's last hundred came in June 2006. Dravid, who batted at No. 4 today, spoke about the period. "A lot of balls you feel, shucks I should have hit that for four. But you hit it to the fielders. You play a lot of balls and if I had converted four or five into boundaries the score could have been 65 or 70 instead of 50. It's about piercing the gaps. You just need to beat the field 4-5 times." In this period Dravid has often not had the rub of the green but he was lucky to get several breaks in the first innings in Sydney, when he added a vital 175-run stand with VVS Laxman. "The way Laxman was batting took a lot of pressure off me," he said of the stand that set up India's platform. "I just recognised what my role would be in that situation. I knew what I needed to do and I'm sure roles might be reversed when things are going for me. I was a little disappointed that I got out after 50 but it was important to lay the platform for what we thought was a very good first-innings score." Experts felt Dravid's poor run was owing to his tense mindset and urged him to relax his mind before a big game. 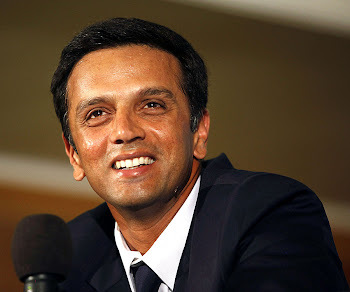 "I feel I'm in a pretty relaxed state of mind," Dravid said with a smile. "I've been quite relaxed, irrespective of the impression that's been given." Dravid's half-century, along with Wasim Jaffer's 92, pushed India to 9 for 325 in their first innings at the Manuka Oval. Dravid made the most of some loose offerings from legspinner Ryan Bulger and struck a few confident drives off the seamers as well. Was he happy to return to the middle order? "I'm happy to play for my team, irrespective of where it is," he dead-batted. "I was happy to keep playing and spend some time in the middle." However, he didn't want to commit about his batting position for the third Test in Perth, starting in a week's time. "It's up to the team management. I'm sure they will decide based on the combination and conditions. Irrespective of where I bat, hopefully me and Wasim can put a good partnership."